Summary: Dear Peaches, America is perfect! Okay, so Vicenza isn’t being totally honest with Peaches, her best friend back in Manila. But what fun is it being the new girl at snooty Grosvernor High? Or rooting through the Salvation Army for unholey cashmere sweaters? Or having culture-shocked, embarrassingly clueless parents? Review: Fresh Off the Boat centers on 14 year-old Vicenza and her struggle to adjust to life after immigrating to America — her struggles seem mostly dominated by her wish to assimilate, be popular, and catch the eye of some cute guy. But, as the book progresses, a story about friendship and family reveals itself. What really got me was the strong depiction of family relationships and friendship. The romantic subplot involving the generic-cute-boy love interest paled in comparison. 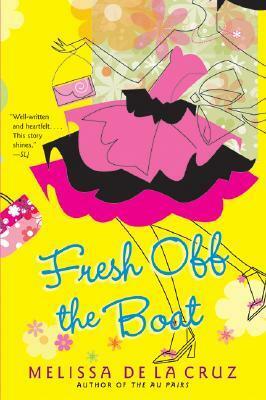 This book definitely falls more into middle grade territory and is a fun, lighthearted read. At times, it’s difficult to get past the boy-obsessed viewpoint of Vicenza, but once you do, it’s all worth it.